"Be bold, be brave but be TASTEFUL." 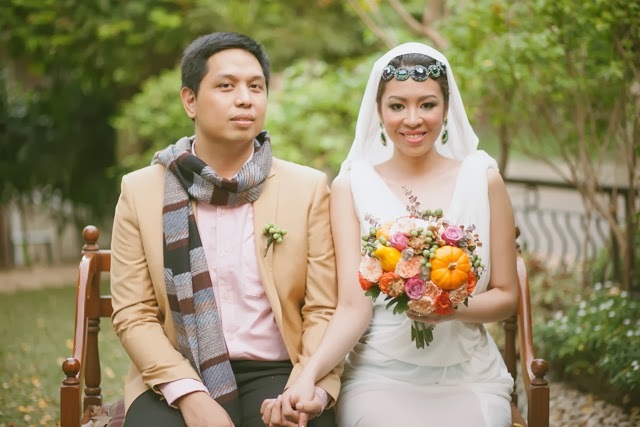 Stylist to the stars and a rebellious bride herself (her prenup and wedding have both been featured here in RB! 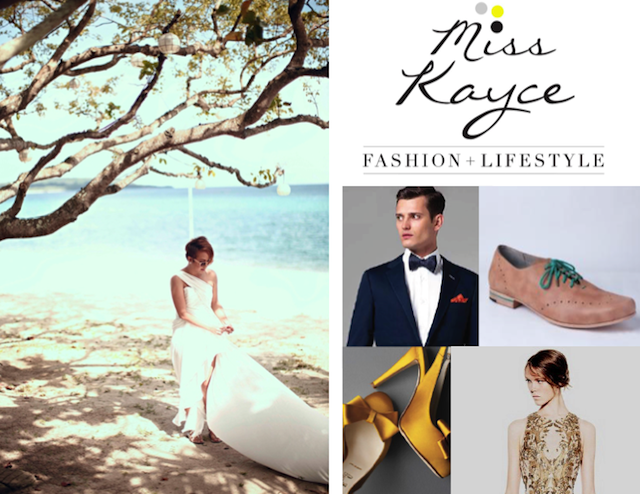 ), KC Leyco-Mempin of Miss Kayce Style Team emailed us for a collaboration shoot and her email couldn't have come in a better time! As mentioned, our lucky stars really did align for this shoot (back track HERE). 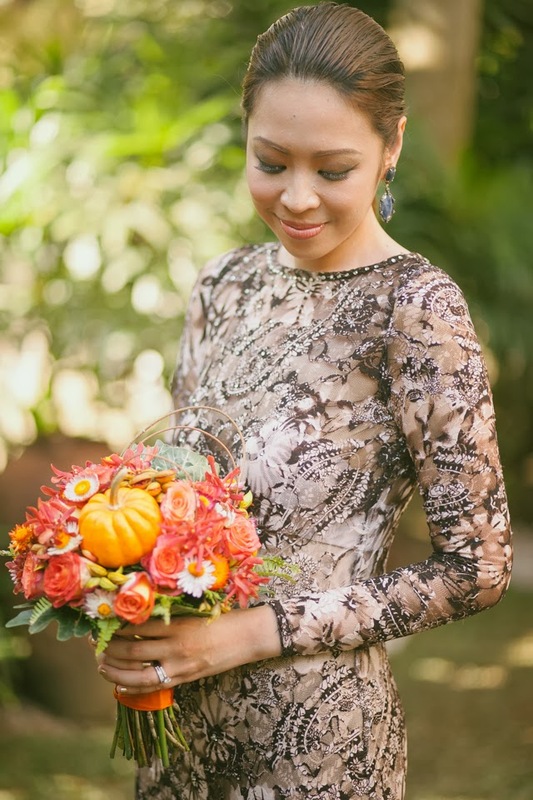 Since RB Mica and I have been styling our own shoots, it was such a breath of fresh air to work with a pro! 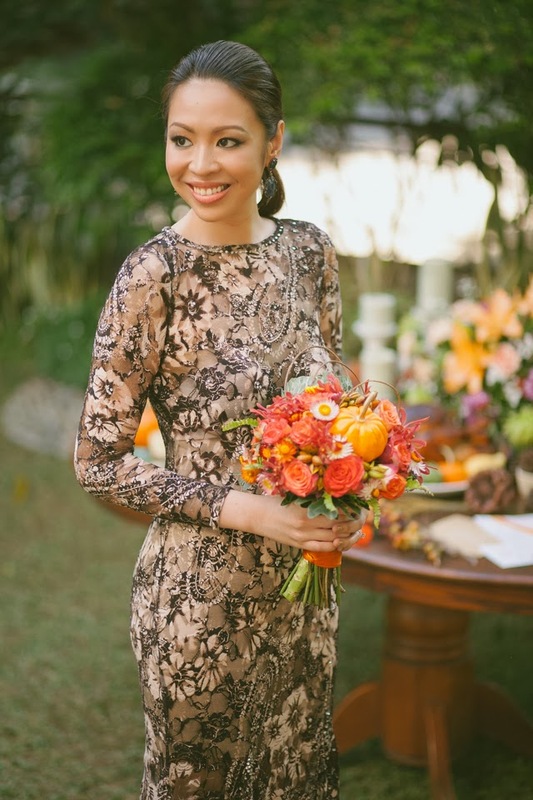 We were quite impressed with KC and Camz (KC's styling associate) from start to finish. Professional, natural pros, organized, and with an original vision, we have nothing but high praises for them. 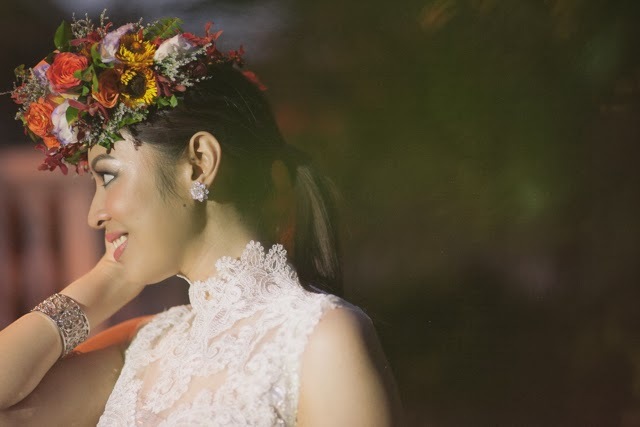 What's more, Miss Kayce Style Team made sure to give as much thoughtful attention to the groom...which let's be honest, tends to be forgotten during shoots because all eyes are on the bride. 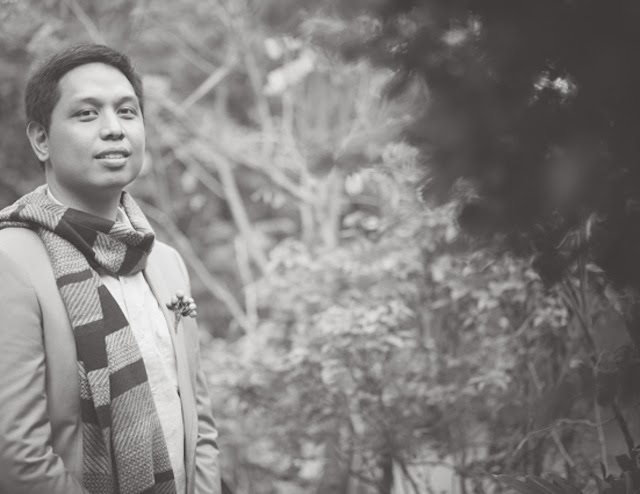 Most guys are kind of "iffy" when it comes to shoots like this, and RJ is of course no exception to that. But he sweetly, patiently, and lovingly went through the entire ordeal just for Jaycee. 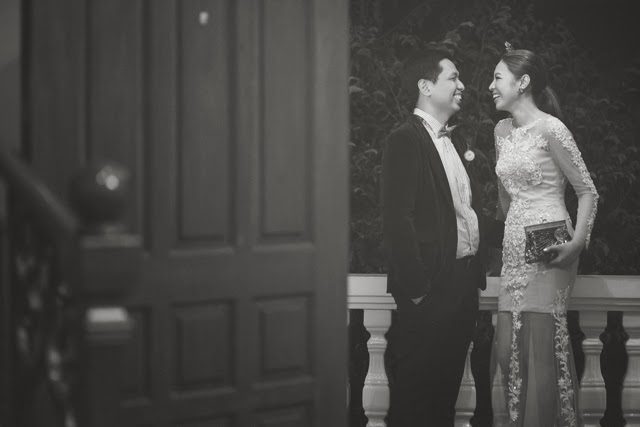 They are a kind-hearted, grounded, and beautiful couple to be around and we are showering them with all the positivity that we can throw their way! 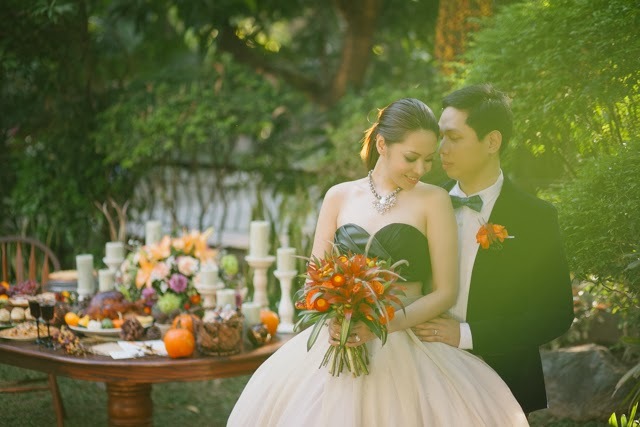 Jaycee & RJ's wedding is set next year and ironically, all of their wedding elements are all set--EXCEPT for Jaycee's gown. 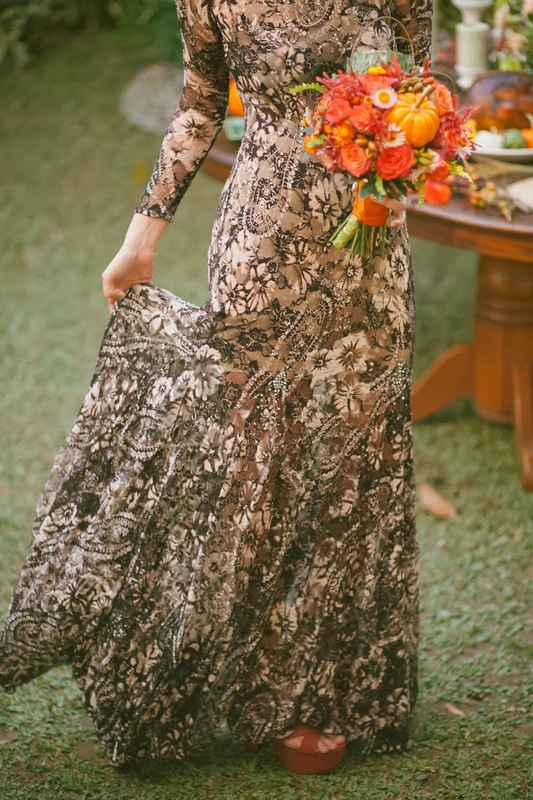 The thing is, Jaycee is a rebel bride and the designers that she's spoken to so far, haven't nailed her direction yet which she calls: "Mahinhin na Malandi" (In English, naughty but nice / sweet but spicy / angelic but coquettish haha!). This shoot though was a revelation for Jaycee and it allowed her to explore her options. Why, she had a total of FIVE looks for this shoot (and we could have had more if we didn't run out of natural lighting)! So it's time to zero in on one of the most highly anticipated parts of our feature--the wicked wardrobe! 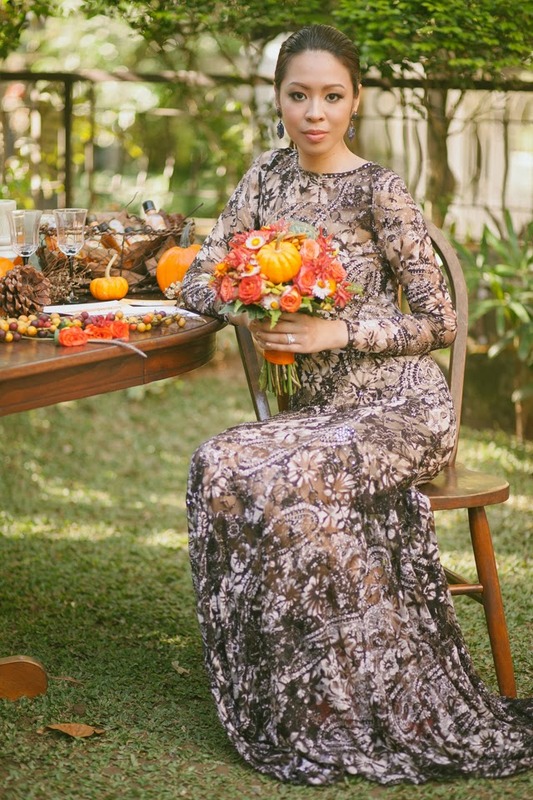 KC shares: "Following the concept of Thanksgiving/fall and RB team's pegs of how everything else would look, we wanted the bride to be the highlight of the shoot. We wanted her to fit in the setting yet still standout. 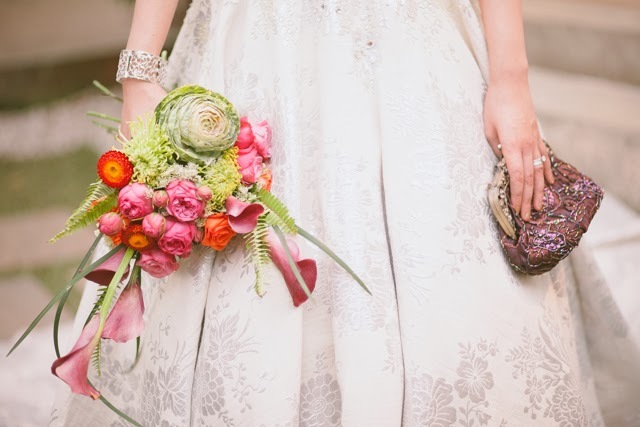 We dressed her up in rebellious gowns and jewelry that other brides won't necessarily match together." 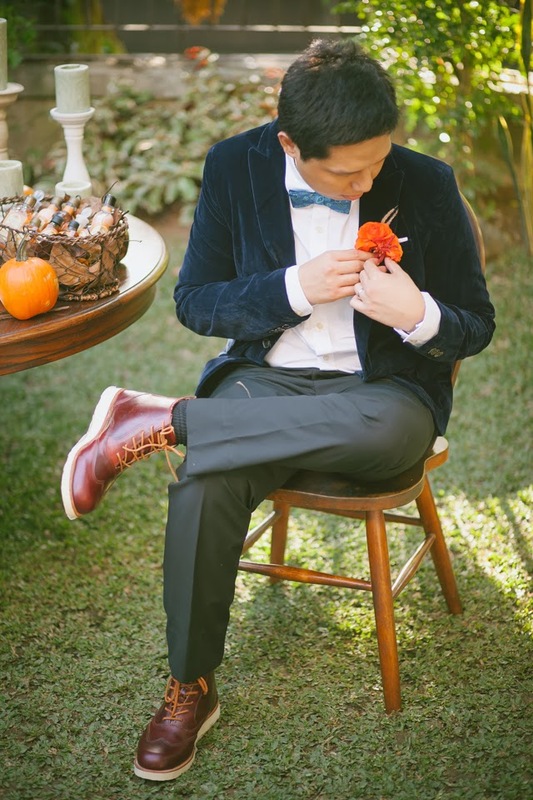 KC shares: "Don't forget the groom's outfit! You're spending a lot on your gown, let him spend some for his suit. :) He should equally look good just as much as you. 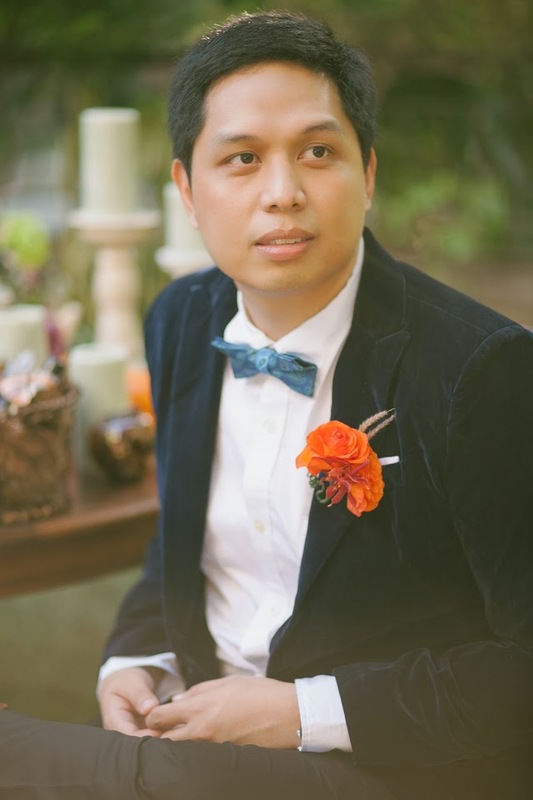 Choose a designer/label you are comfortable with that can custom tailor a suit/barong/tux for him." KC adds: "Most suits are worn in "sets". With sets, I mean matching suit jacket/coat and pants, complementing dress shirt and ties or bow ties in their color motif. 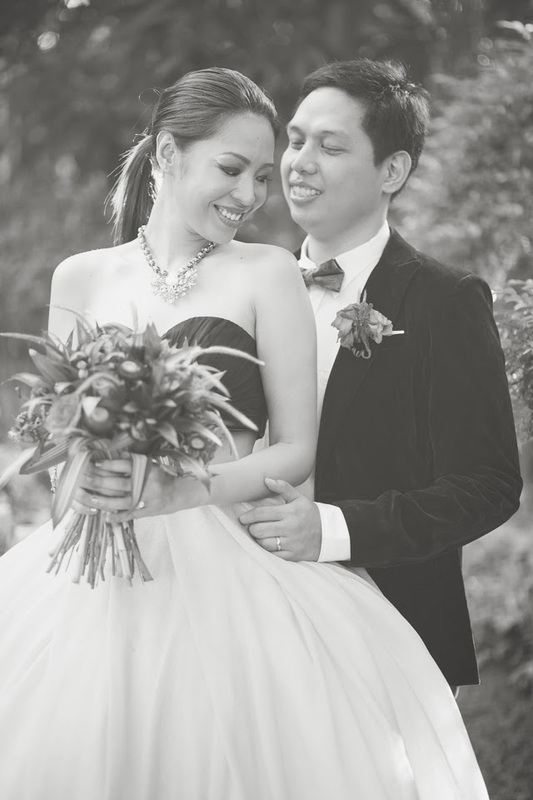 We are so happy that we were able to mix and match suits for this shoot. 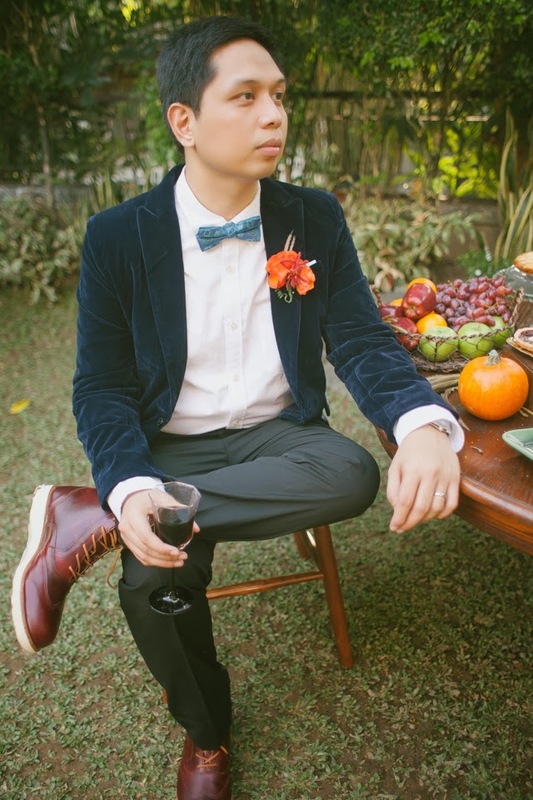 We also loved that Onesimus Suits & Barongs have velvet blazers in their collection. 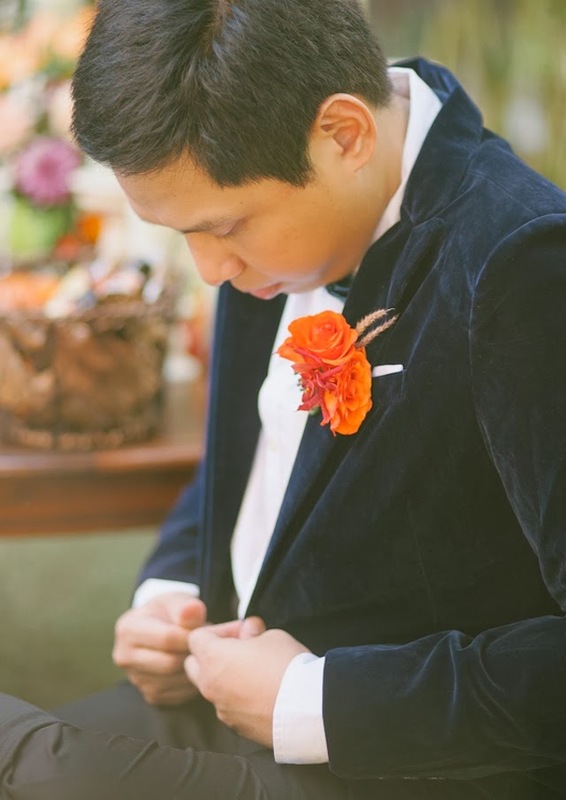 We love the color and texture of velvet fabric. 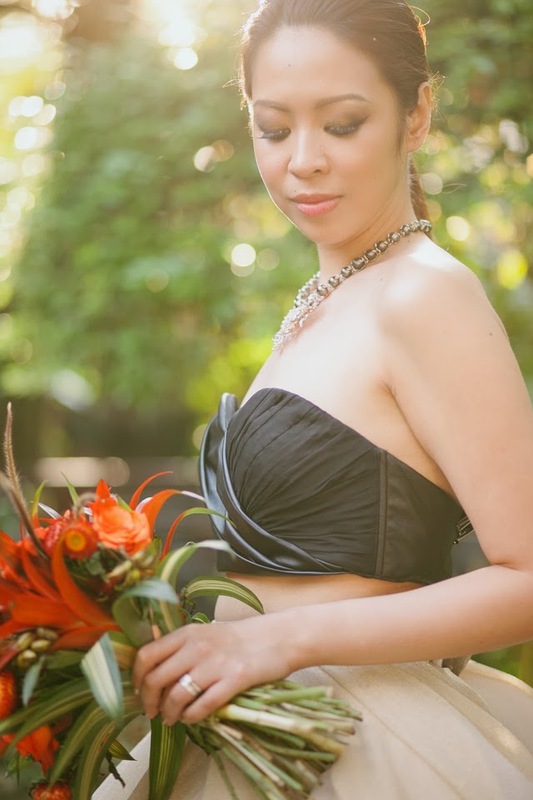 Wool is typically cool but velvet is so very awesome"
2 piece gown (leather cropped bustier with champagne ball skirt) by Jiezl Sunga. 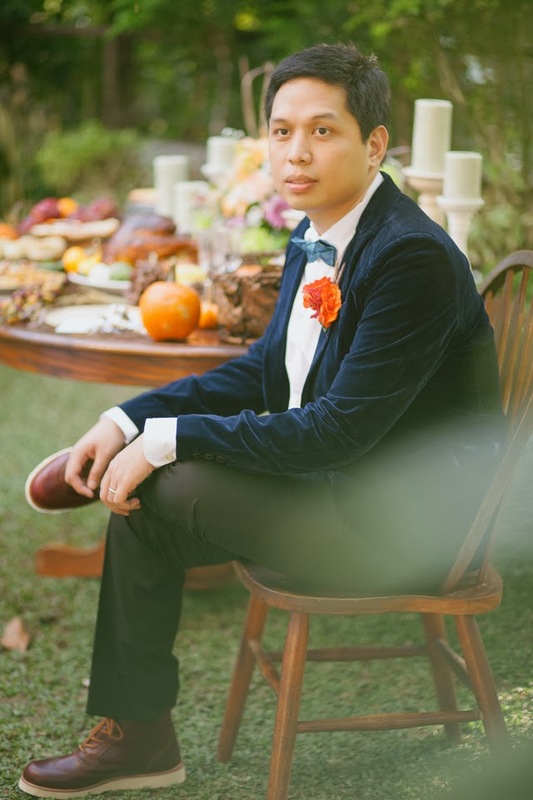 KC's advice: "Have the guts to wear what you want keeping in mind your true self and having the guts to also take in what and/or how people will react when they see what you chose for your wedding. True rebels don't care what others say and they know what they want." 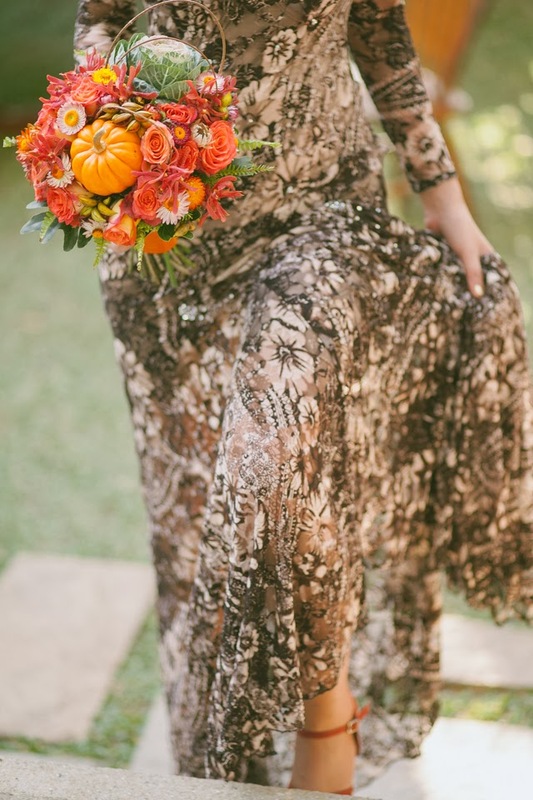 KC shares: "Fall/Autumn colors were kept in mind and also the styles and textures that we would see on the runway or fashion magazines. We created mood boards/pegs of styles and colors/textures. This is what came out: bold prints and colors, leather for texture, and hood in replacement of the veil or just a hint that FALL/AUTUMN is also a time where long sleeves, hooded jackets,knits come out." KC on rebellious bridal jewelry: "Key pieces of jewelry is just as important as the gown. 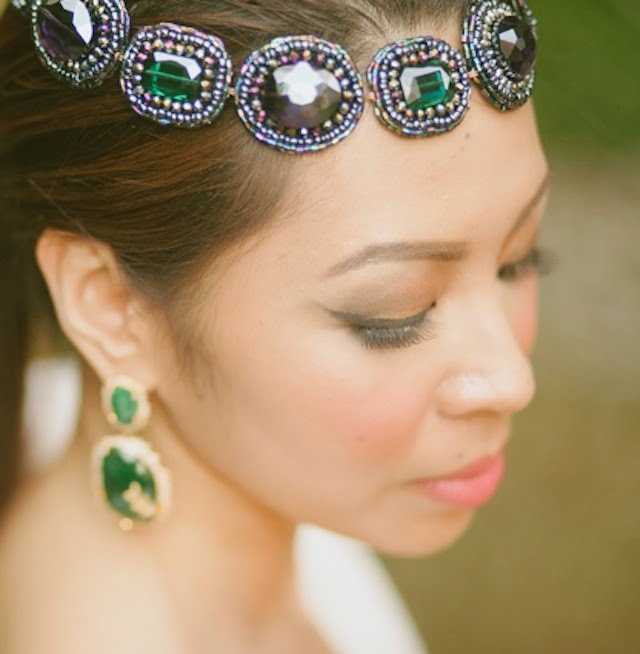 We chose black pearls, blue sapphire and opal from Imelda's Jewelry collection to complement our gowns, away from the usual white pearl and diamonds." 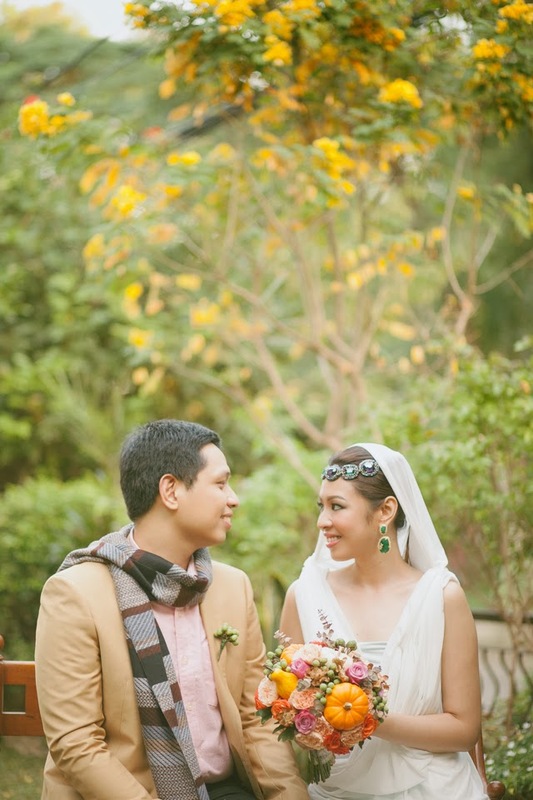 "I think our style inspiration for this shoot is to inject colors and prints and not to be the commercial bride / groom. 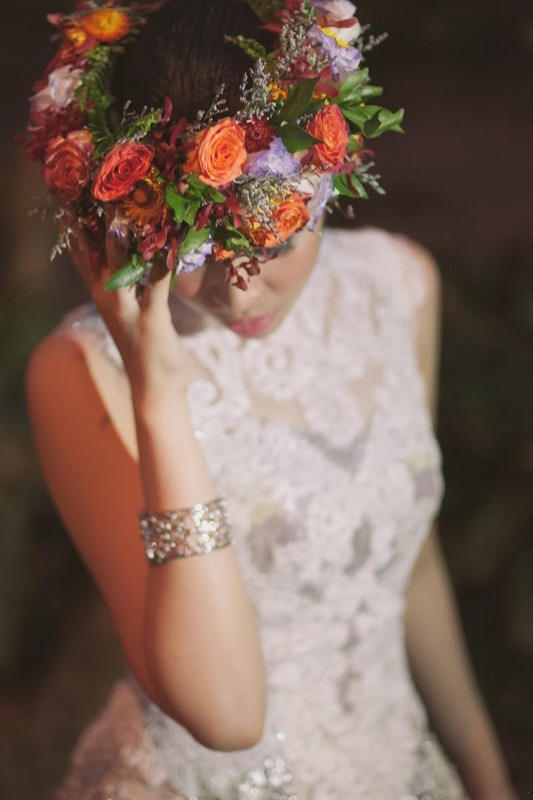 I think for the brides, if they want to be a rebel / different it doesn't have to be over and beyond their personality. 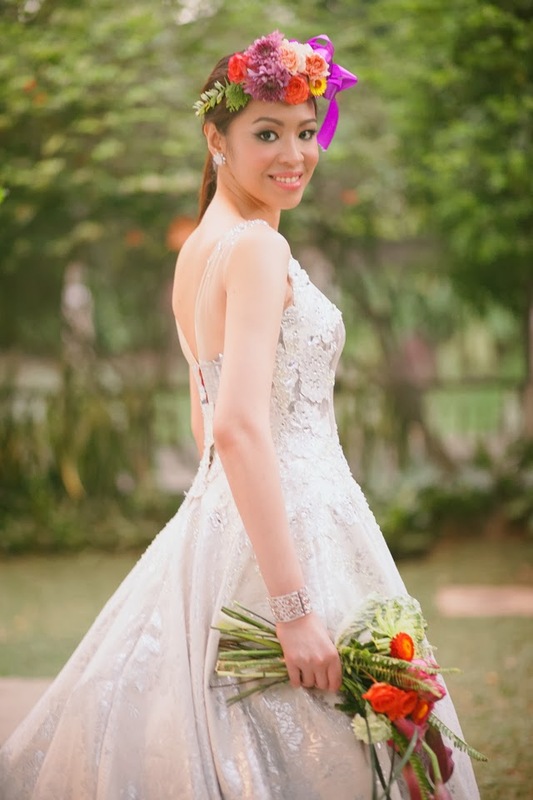 And do not to be afraid of colors especially in their wedding gowns for as long as when you look back you won't regret it. The key also is consistency with their style / theme." RB Mica has this to share about Jaycee's makeup: "I did a wearable smokey eye using browns. I kept everything else simple and mostly in the shades of peaches. 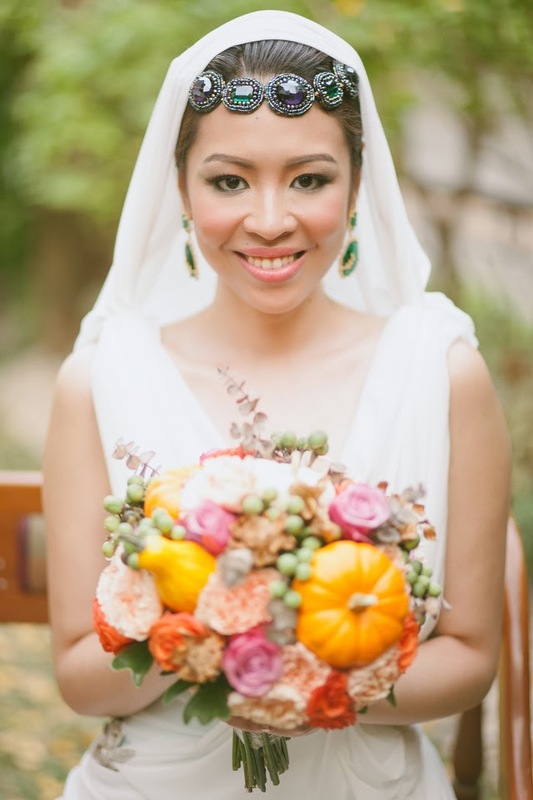 I also redefined the bride's eye shape with a winged look using eyeliner." Final words from me, RB KAI: "Having a home-based wedding doesn't mean you can't be as glamorous as you can be. In fact, this could very well be the perfect time to splurge and experiment with several looks since you'll be saving a lot on venue fees! 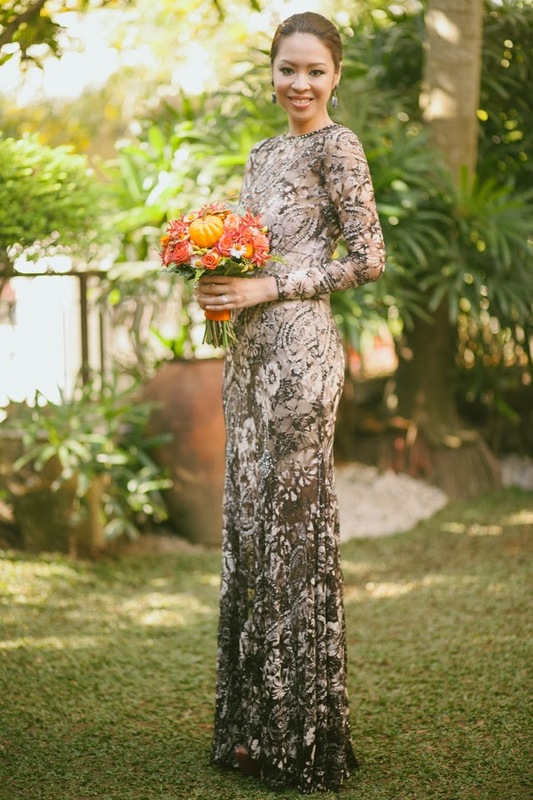 When we started this blog 2 years ago, it was so difficult to find rebellious bridal looks. But here we are today collaborating with some of the finest rebel talents our industry has to offer. 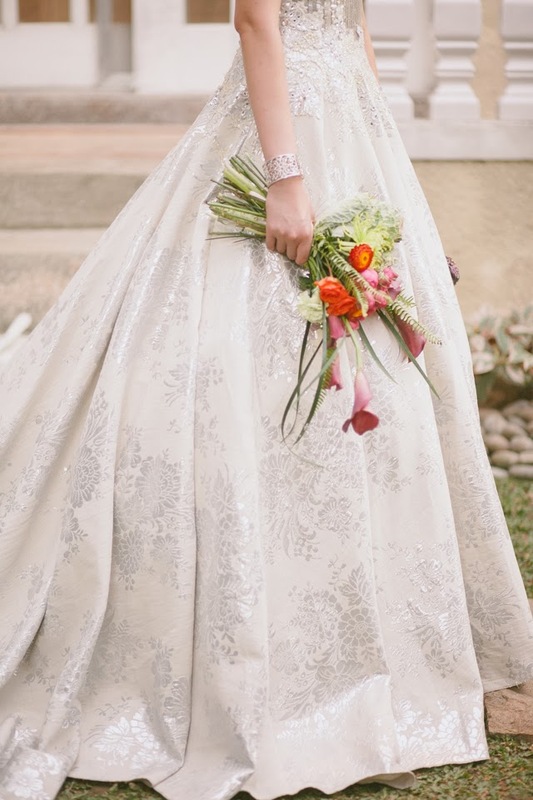 We hope that in this all-out effort we are offering to you, you will find something that unleashes your inner rebellious fashionista bridal personality!" 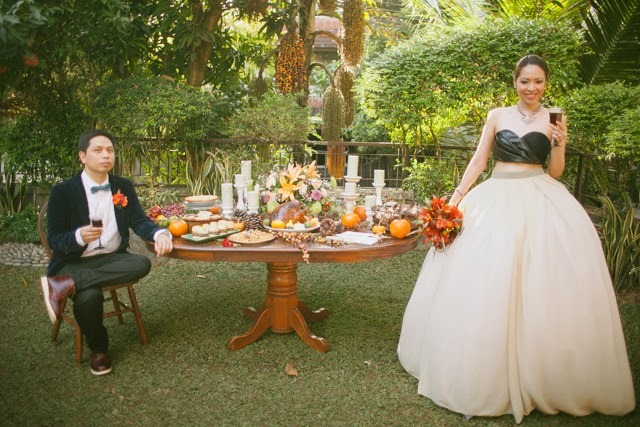 A Thanksgiving Backyard Wedding - The One of Foodie, Food, Food!